Wondering whether you can let the same lift truck roam both indoors and out? In some cases, the answer is yes—but plenty of restrictions apply. Here's what to keep in mind. Every warehouse and distribution center (DC) seeks to optimize the size of its forklift fleet to ensure it has enough trucks to meet its operational requirements while keeping the cost of ownership to a minimum. One way to work toward that goal is to buy or lease forklifts that can perform different types of work rather than maintain separate vehicles for different applications. An increasingly common example is what you might call "free-range" forklifts: equipment that can be used both inside and outside a building. In addition to cost, there are other reasons to choose lift trucks that can operate indoors and out. They boost productivity for certain types of businesses—like those that must load or unload trailers from the ground rather than from a dock, for retailers like convenience stores that bring pallet jacks in and out of stores, for manufacturers that store large items outdoors and bring them inside to feed into production lines, and for freight handling facilities where lift trucks are regularly exposed to the elements. Harmonizing engine and model types helps make service and maintenance easier and more efficient. And sometimes, a smaller operation simply doesn't have space to park a lot of forklifts. In the right circumstances, a double-duty approach can be an effective strategy. 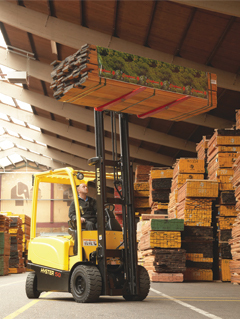 But not every lift truck is appropriate for both indoor and outdoor use. 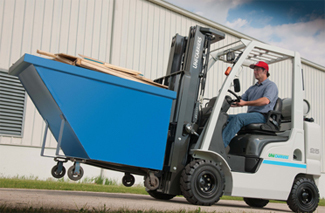 If you're thinking about using an existing sit-down counterbalanced lift truck in both environments or are looking for a new one that could go either way, here are some considerations to keep in mind. Tires. Tires play an outsized role in determining where a lift truck can safely travel. That's because outdoor surfaces that are full of rocks, bumps, ruts, or debris can damage tires and make a truck and its load unstable. Even a paved parking lot that's pocked with potholes could cause trouble, observes Mark Faiman, internal combustion product manager for Toyota Material Handling U.S.A., the U.S. distributor for Toyota forklifts. The two most common types of forklift tires are pneumatic and cushion. Pneumatics, with deep treads for gripping uneven terrain, are typically used outdoors. They're large enough to raise the forklift chassis so it clears rough ground, but their size also results in a fairly wide turning radius. They are available either in solid rubber or filled with compressed air, like automobile tires. Both are rugged and reliable, but solid pneumatics won't go flat, so they're especially useful where there are sharp objects and other debris on the ground. It's also possible to insert foam into air-filled pneumatics to reduce the impact of punctures or other damage to the tire. Cushion tires are made of smooth, solid rubber that is fitted around a metal band. Their small profile facilitates a tight turning radius. But they do not have the same degree of traction as pneumatics, so they're mostly used on smooth indoor surfaces and on loading docks. They can also handle a well-maintained flat outdoor surface. Still, caution is in order: Cushion-tire trucks may sink into asphalt that's been softened by high heat and sun exposure, warns Bob McGowan, director of industry sales for forklift manufacturer Hyster Co.
Power and fuel. Historically, cushion-tire electric forklifts, which don't emit harmful fumes and pollutants, have been used indoors; cushion-tire internal combustion (IC) trucks powered by propane, a type of liquefied petroleum (LP) gas, were considered indoor/outdoor models; and IC pneumatic-tire trucks powered by diesel or propane were used outdoors, say the experts at Mitsubishi Caterpillar Forklift America (MCFA), which manufactures and distributes Mitsubishi, Cat, and Jungheinrich forklifts. But those traditional distinctions are no longer set in stone, and buyers have more options than ever before, they say. A major reason for that shift is that today's IC forklift engines "are really clean," says Scott Johnson, vice president of sales and marketing at lift truck manufacturer Clark Material Handling Co. "You still have to ensure proper ventilation and air flow," he says, but lower emissions allow some trucks that had been relegated to outdoor use to now operate indoors too. He credits improved engineering and better-quality fuel for the lower emissions. In particular, he cites efforts by the Propane Education and Research Council (PERC) to ensure that propane distributors filter the fuel properly and that tanks are clean and free of contaminants. "The quality of the fuel today is by far the best we've ever seen," Johnson says. In addition, U.S. federal regulations have required lift truck makers to slash emissions from diesel-powered forklifts. Because they are much cleaner-burning than in the past, even these outdoor heavy lifters may be used in some well-ventilated indoor environments now, says Craig Seager, director, industry sales, for lift truck manufacturer Yale Materials Handling Corp.
Another significant change is that heavy-duty battery-powered electrics have caught up to IC trucks in terms of productivity, power, and lifting capacity. Many are equipped with outdoor-friendly pneumatic tires too. This transformation is driven by the growing number of customers looking for cleaner, higher-capacity trucks that can handle heavy lifting and perform just like an IC truck, Seager says. The manufacturers are paying attention: All of the companies we spoke to for this article offer sit-down electric forklifts with big batteries, powerful motors, and pneumatic tires, including some models that can carry loads of up to 11,000 or 12,000 pounds. Dealers can recommend protective devices for lift trucks that operate outdoors or in messy conditions, Smith notes. These include such things as an underbelly screen to keep the cooling system from sucking in debris, protective covers for hydraulic lifting or tilt cylinders, elevated air intakes, and a precleaner to keep dirt and other contaminants out of the engine, he says. Other examples mentioned by the experts we consulted include specially sealed wiring, "washdown" packages that offer protection against moisture ingress for trucks that must be hosed down, and using extra air filters in the filter housing. Length, width, and height. There are size differences between sit-down trucks designed for indoor use and their outdoor counterparts. For example, pneumatic-tire trucks usually have longer, wider chassis; have a higher ground clearance; and, because the tires are larger, have a larger area of contact with the ground than cushion-tire trucks do, Toyota's Faiman says. An electric truck designed for outdoor use usually will be larger than a comparable IC truck because it requires a larger-than-usual battery box to provide the extra power typically needed for outdoor applications. 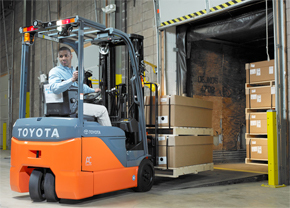 An outdoor lift truck's larger width, length, and turning radius affect how it performs in a warehouse or DC's aisles. An outdoor truck needs 10- to 14-foot-wide aisles to turn while carrying a load or to pass another truck, according to MCFA's experts. Further, introducing outdoor IC trucks into an aisle configuration designed for electrics with a short wheelbase can compromise productivity, says Clark's Johnson. If operators have to do multipoint turns to pick or put away pallets in racks, they will have a problem, he says. "They probably have throughput commitments per shift, and if they can't do [the operation] in one turn, it will slow them down and make it hard to meet those commitments." Operators should be especially conscious of the dimensional differences between indoor and outdoor trucks while loading and unloading trailers, Hyster's McGowan says. To illustrate his point, he offers three examples of cases where operators could run into trouble. A pneumatic forklift with a 48-inch overall width that's unloading pallets that are 48 inches wide from a standard eight-foot-wide trailer can grab two pallets that are positioned side by side. However, if another receiver's pallets are positioned front to back along one side of the trailer, the forklift won't be able to pass the other receiver's shipment to grab pallets farther back. The taller tires and higher ground clearance of an outdoor forklift make it a few inches taller than indoor equipment. This becomes a problem when working inside a trailer. Even though both lift trucks may have masts with 89-inch down heights and 189-inch up heights, McGowan says, the greater overall height of the outdoor truck restricts the working mast height inside the trailer, to the point where it may not be usable. Dock-height variations must be accounted for when an outdoor truck enters a trailer. According to McGowan, the typical dock height is about four feet, and the typical dock plate adds a three-inch hump. Adding a dock board to a loading dock that's 3 feet 10 inches raises the entry point by four to six inches and creates a steeper angle of entry. In both cases, a pneumatic-tire truck could be too tall to enter the trailer. "These scenarios are why we strongly recommend demo-ing any truck you are considering buying or leasing," McGowan says. "Test it in every potential application where you would ever see yourself using it so you can foresee these kinds of problems and constraints." Operator comfort and safety. 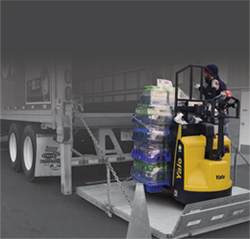 In addition to considering the functioning of the equipment itself, it's important to think about how using the same forklift indoors and outdoors could affect the operator's comfort and safety, Yale's Seager says. For example, different lights, such as headlights, spotlights, and turn signals to better illuminate the yard or light up an alley, might be in order. A full-suspension seat will offer better ergonomics on uneven surfaces and ramps. And any truck that will operate outdoors in cold or wet weather should have an enclosed cab and a heater. Indoor trucks that venture outside may need additional attachments and accessories that weren't necessary on smooth indoor surfaces, Faiman says. For example, clamps or a strapping system may be needed to hold loads in place outdoors while they're driving over uneven ground. Demand for lift trucks that can be used both inside and "outside the box," as it were, has grown to the point where at least one manufacturer felt it was time to design a forklift specifically for that market. UniCarriers says it believes its Nomad series is the first forklift expressly designed to straddle both worlds, falling "between a traditional cushion-tire Class 4 and a pneumatic-tire Class 5 forklift," according to Smith. The trucks are classified as a Class 5 pneumatic, he says, but they have a smaller footprint, tighter turning radius, and a lower chassis than a pneumatic, while offering a slightly bigger profile and higher ground clearance than comparable cushion-tire trucks. But is a dual-use truck the right way to go? For many operations, the answer will be an unequivocal yes. If there's intermittent or minimal demand, one truck can be a good choice, McGowan says. But if demand for a truck that works both on the dock and in the yard is so great that "you're having to hold somebody in one position so you can handle the other," then separate inside and outside trucks are necessary to maintain productivity. Ergonomic considerations may also factor into the "one truck or two?" decision, Johnson notes. If the operator has to constantly jump on and off a forklift during a shift, then equipment designed for outdoor use may lead to ergonomic problems. In such cases, "the dealer might recommend a different product for inside the DC—maybe a stand-up counterbalanced rather than a sit-down IC, for example." Once the decision to consolidate has been made, other questions arise. Should it be an indoor truck or an outdoor type? The various considerations discussed in this article should be carefully considered. But McGowan's counsel is generally to "lead with a Class 5 forklift for outside, then make sure it also meets indoor criteria." Should it be an electric or IC model? Cost is relevant, of course. Electric trucks typically come at a higher upfront cost than IC models, but MCFA's experts note that in terms of energy consumption, electricity costs less than gas or diesel. Regardless, they add, the long-term total cost of ownership for the equipment should influence the decision. One thing everyone consulted for this article agrees on: A double-duty approach should only be implemented where safety, productivity, and the condition of the equipment and facility will not be compromised. The best way to be sure, they urge, is to have an authorized dealer survey every application before you decide which path to travel. Feedback: What did you think of this article? We'd like to hear from you. DC VELOCITY is committed to accuracy and clarity in the delivery of important and useful logistics and supply chain news and information. If you find anything in DC VELOCITY you feel is inaccurate or warrants further explanation, please ?Subject=Feedback - : Free-range forklifts">contact Chief Editor David Maloney. All comments are eligible for publication in the letters section of DC VELOCITY magazine. Please include you name and the name of the company or organization your work for.